For the 25th consecutive year, the NHLPA Golf Classic brought NHL players together in the name of charity. To mark the special occasion, every current player in attendance at Glen Abbey Golf Club Wednesday was given $2,000 for the cause of their choice as they participated in individual and team competitions. Over 50 current and former NHL players took part in the day's action, and some of them even brought guests to take part. 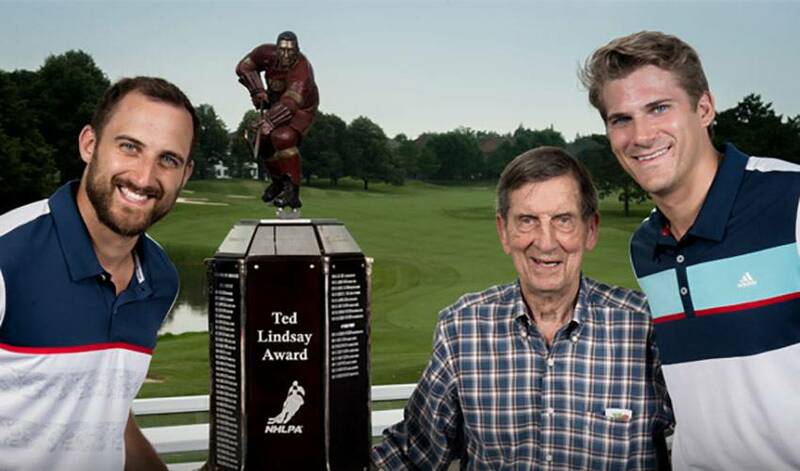 Also on hand was Hockey Hall of Fame forward Ted Lindsay, who is known for his skill, tenacity, leadership, and his role in establishing the original Players' Association. Lindsay's presence was appreciated by all players in attendance, as many made sure to stop for a photo and swap stories with the legendary "Terrible Ted" Some players even had a generational connection to Lindsay. One highlight of the night was a moving speech made by former Executive Director Bob Goodenow, recounting his first and fondest memory of Lindsay in the early 1960s. Goodenow recalled a tender childhood moment at a friend's birthday party, where the surprise of the night was Lindsay himself, signing autographs to the entire party's delight - and Goodenow's first ever NHL player autograph. At the end of the day, Greg McKegg took home the bragging rights for lowest player score of the tournament by shooting three under par with a 69. Following the tournament, Logan Couture landed a mere two inches away from the hole in the NHLPA Member Charity Challenge for $25,000 for his charity of choice, See The Line. Josh Jooris and Darnell Nurse also won $15,000 and $10,000 respectively for autism and CityKidz Hamilton. Everyone went home a winner by helping to bring the grand total donation from the NHLPA Golf Classic to $3.6 million dollars over its 25 years of existence - including $125,000 from the 2017 Golf Classic. For more highlights from the day's action, check out #NHLPAGolfClassic on Instagram and Twitter.